As parents, it can be easy to go about our days and not stop and listen to our kids as we should. Life is busy and stopping to listen can sometimes be an afterthought during those chaotic moments in life. … and a tiny whisper says “I love you” in return. It snaps me back to reality. I need to listen. And there are moments that have even greater importance than the day-to-day. Without stating an actual factual statistic, my estimate is that children ask anywhere between 75-100 questions on a daily basis, maybe more. That is a lot of listening, answering and responding on the behalf of parents. Their questions are innocent. They are just curious little sponges, right? They want to know the complexities of life and how things work. Who can blame them? I ask a ton of questions still to this day as an adult…thank goodness for Google! BUT, there are times in life when it is crucial to really stop and listen to your child. Times when it is important to give them your absolute full attention and be there entirely for them. What are those times? Little ones don’t have a deep understanding of life and death. While it may be hard for us as parents and adults to respond appropriately, it is important. Remember, again…they are asking questions about topics that they don’t know and desire to understand better. If they ask questions about the end of life, answer as best as possible. Sugar-coating things won’t be helpful in the long run while giving too much information that isn’t relevant won’t be helpful either. It’s a balancingact, but important in the growth of the knowledge for your little one. Related: How to handle the loss of a pet as a family. Children can feel anxious just as adults do. Starting school? There are nerves involved. Moving to a new home? Worries may be brewing. Ask them how they are feeling, and truly listen to them. They know their thoughts and their emotions. Allow them to express them freely and help them find a solution. Not all conversations have to be serious! Celebrate their wins! Celebrate their happy moments, big and small. Are they excited that they tied their shoes on their own and want to show you? Embrace their happiness and jump on board. Listen to them gloat on their victories in life, build up their confidence and show them that it’s perfectly fine to celebrate the little wins in life! 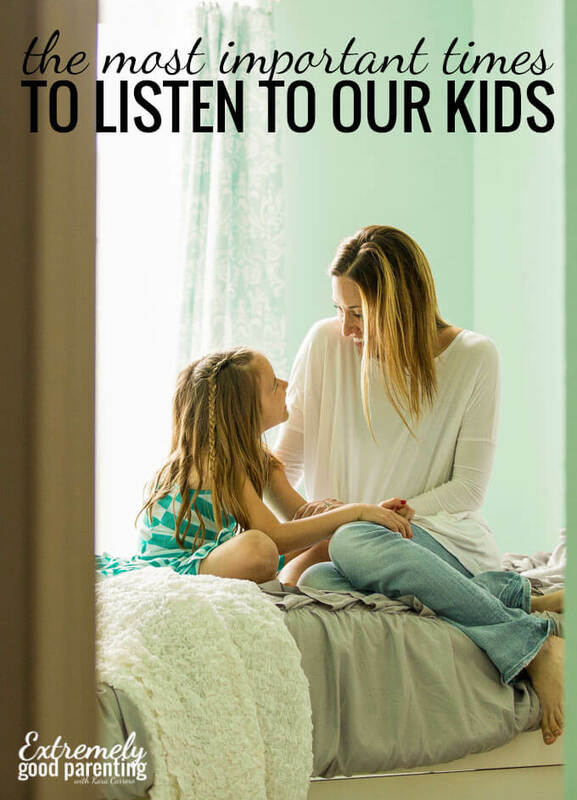 Have you ever stopped and listened to your child playing contently in their room? Talking to no one but themselves in whatever game that they are playing. If not, I urge you to. The information that you will learn is amazing. During imaginary play, children are speaking about things that excite them, scare them, amaze them…whatever comes to mind. You get a quick peek inside their brain, without feeling as though you are probing them for information. What better time to get to know the inner-workings of your child’s mind than to stop and listen to them interacting with themselves? Related: How to foster imagination in young kids. Bullying is hard on anyone, at any age. If your child trusts you enough to tell you that they are having bully issues, listen to them. Often times, children won’t express when they are having negative interactions or feelings with others and may try to keep feelings like that suppressed. If they communicate feelings that they are having in regards to issues with other children at school, be a set of ears for them and listen. Don’t try to interject with problem-solving solutions, just listen. Let them talk out their emotions before moving forward and making a plan. Once they inform you of all the troubles that they are having, it is time to talk to them from your perspective about how you can help them. Ask them how they want you to help as well. You may be surprised at how the lines of communication open. Once they inform you of all the troubles that they are having, it is time to talk to them from your perspective about how you can help them. Ask them how they want you to help as well. You may be surprised at how the lines of communication open. Communication is key with every child to build trust. There are so many other moments as well where your child will be wanting you to lend your ear. Be open to stopping what you are doing to tend to the needs of them. Your child looks up to you and values you. Embrace the trust that they have in you listening to them and helping them. Stop, look and listen to the words that your child speaks. Their words are their way of asking for help and your responses help guide their growth for their future. Get a download to help with behaviors and communication in those tough times. This first page is all suggestions and the other has the second column empty to allow you to write in what works for you family. Simply input your email below and it will be in your inbox. Plus, since you’ll now be a part of the Extremely Good Parenting community, we’ll send you some other awesome freebies & advice from time to time.